German officials have ordered a cover-up of crimes committed by migrants to prevent causing alarm, a local newspaper has claimed. Asylum seekers are being recruited across the country as cheap drug dealers as well as petty thieves, says German newspaper, Bild – the biggest daily paper in the country. The paper accused the police of covering up the extent of migrant crimes in order to stop concerns among the general population. It also claimed asylum seekers were prepared to work for a few euros couriering drugs across the country and said they were being signed up almost as soon as they had registered as asylum seekers. Migrant crime was apparently the hot topic of discussion at gatherings of police, city officials, health officials and other officials dealing with the drug problem in the city of Frankfurt. As well as drug related crimes, asylum seekers were also being used to sell stolen goods such as mobile phones, which in many cases were sold on to other refugees. But the paper said that all of the officials dealing with the problem had been ordered not to talk about it, as it was an extremely sensitive subject that has been forbidden to be referred to in an ‘offensive manner’. The reason given by the paper was to avoid alarming the general public already concerned with the vast number of asylum seekers the country has allowed in, but also to avoid providing material for right-wing extremists. New arrivals to the country were apparently the most desirable as they did not have any formal way of complaining about what they were asked to do and rarely gave problems to the drug-dealing Mafia. The most successful couriers are then being recruited into the Mafia and are also being used to bring in further new recruits. This shocking claim comes as Germany will have registered just over a million migrants by the end of the year, a local paper has claimed. This is roughly in line with the latest predictions but still about five times more than last year. As Europe’s biggest economy, Germany is a magnet for migrants partly due to generous social benefits and is taking in more refugees from the Middle East and Africa than any other EU state. Authorities expect about 125,000 asylum seekers to have registered on Germany’s EASY system in December, down considerably from 206,000 last month, Saechsische Zeitung reported, citing unpublished government figures. That brings the overall figure to 1.09 million people. Migrants cross the Hungary-Croatian border. 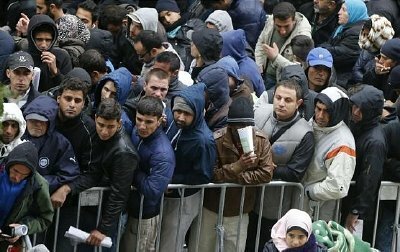 Germany was the ultimate destination for most who were lured by the promise of generous social welfare. A spokeswoman for the Interior Ministry declined to confirm the numbers which will be available in early January, but Interior Minister Thomas de Maiziere said in a statement the numbers were falling slightly. 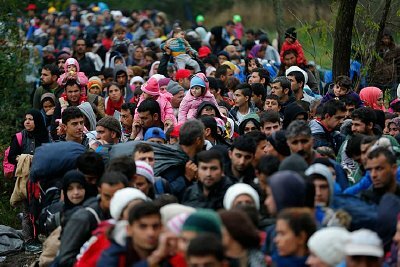 Germany’s 16 federal states plan to spend about 17 billion euros to deal with the refugee crisis next year, a newspaper reported on Tuesday. Chancellor Angela Merkel’s popularity has waned as a result of her open-door policy, with some of her own conservatives – especially in Bavaria, the entry point for many seeking asylum – seeking a cap on numbers. In a speech to her party this month she sought to silence critics by saying she would stem the flow of refugees. De Maiziere said that creation of an orderly processing of refugee applications meant the situation was improving and that authorities were working hard to register and accommodate refugees. Merkel’s government is putting measures in place to speed up deportations of those refused asylum. It is also pushing other EU countries to take more migrants and to work with Turkey to ensure fewer people come to Europe in the first place. But de Maiziere rejected demands by Merkel’s conservative Christian Social Union (CSU) in Bavaria to ban migrants from entering Germany unless they have valid identity papers.